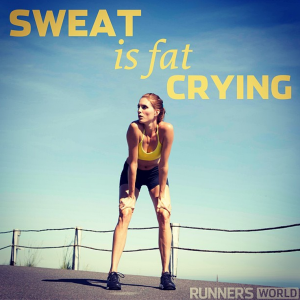 The Many Benefits Of A Good Sweat! I know many of us cringe at the site of the person in the gym sweating and dripping like they just came out of a shower. You think to your self, “how disgusting”. How can that person sweat that much? That can’t be healthy. They must be super unfit? Or you may think, as the picture says, “Man, they must really burn some fat”. Truth – the picture is bogus, it just made me lough out loud – more sweet does not equal more fat burned. People generally think sweat is nasty, disgusting and leaves germs wherever there is a sweat stained spot. My high school football coach would disagree. He basically wore two shirts (if any) during our 2 a day practices in high school. On of which said, “Nobody Ever Drowned In There Own Sweat”. I believe if Coach Shields was around our gym today, he may disagree on that statement. Could it be that sweating has many health benefits? Personally, I am not a great sweater and do have issues of cooling down when outside temperatures are to hot. I’m in awe of those people who workout around me and sweat right through their shirts. For men in particular, there is a great satisfaction that comes with a good sweat. But cold it be that the mental satisfaction has nothing to do with the exercise, but what is actually happening to you? Attached is an article promoting the benefits of a good sweat. For those of us that don’t sweat well, don’t get jealous and for those of you who drip like a shower…enjoy. ~ Boosting your health with the use of a sauna.